The implication is that support for changes - regulatory, legislative or in terms of personal usage - is growing. The percentage of people who think the internet is good for society is shrinking. Roughly 70% of American adults who use the internet believe it’s mostly good for society, down from 76% in 2014. The change was most prevalent among older Americans. 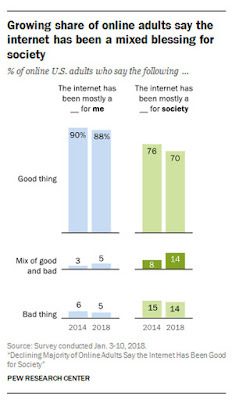 64% of online adults over 65 say the internet has been “a mostly good thing for society." In 2014, that number was 78%. More people are giving the internet mixed reviews, according to data from Pew Research, which found an increase in the percentage of people who think the internet has had both positive and negative impacts on society. The percentage of people who think the internet is good for society is shrinking. Roughly 70 percent of American adults who use the internet believe it’s mostly good for society, down from 76 percent in 2014, Pew found. That doesn’t mean those people now believe the internet is necessarily bad — it’s just more complex. The portion of people who believe the internet is a “mix of good and bad” for society nearly doubled in that same time, from 8 percent to 14 percent of those interviewed. But the percentage of people who think the internet is bad for society remained virtually unchanged. Pew found that the change was most prevalent among older Americans. About 64 percent of online adults over 65 say the internet has been “a mostly good thing for society,” Pew wrote. In 2014, that number was 78 percent. The fact that more people can’t figure out if the internet is good or bad isn’t really a shock. The internet is great for many things, like helping people stay in touch, spreading vital information and easing the burden of everyday tasks, like shopping or paying the bills. Many people, including those of us at Recode, have been trying to figure out how these tech behemoths are viewed by the general public. In a recent survey we conducted along with SurveyMonkey, just 10 percent of respondents said that Facebook has had the “most positive impact on society” of all the tech companies.